You’re NOT going to want to miss the Chicago Tap Theatre! Bringing their unique style of dance to the Kaneland Auditorium, the Chicago Tap Theatre will present a tap story show. Chicago Tap Theatre had gained a strong enough foothold in the extremely competitive Chicago dance world to inaugurate its first self-produced, three-show season, putting itself on the same level as such established companies as Hubbard Street Dance Chicago and River North Dance Chicago. We are thrilled that the Chicago Tap Theatre will be on the Kaneland Auditorium Stage from 11:30 – 12:30 am. The Chicago Tap Theatre has also graciously donated a pair of tickets to an upcoming show for the Art Auction! 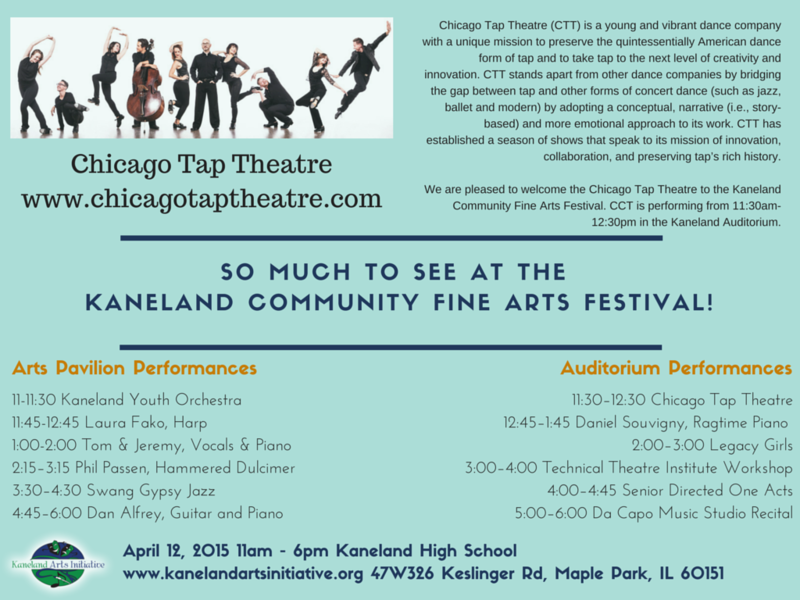 Plan to attend the Chicago Tap Theatre performance at 11:30 am at the Kaneland Community Fine Arts Festival!